By Melissa Lennig on December 11, 2016 Leave a Comment. This content contains affiliate links. As an Amazon Associate I earn from qualifying purchases. 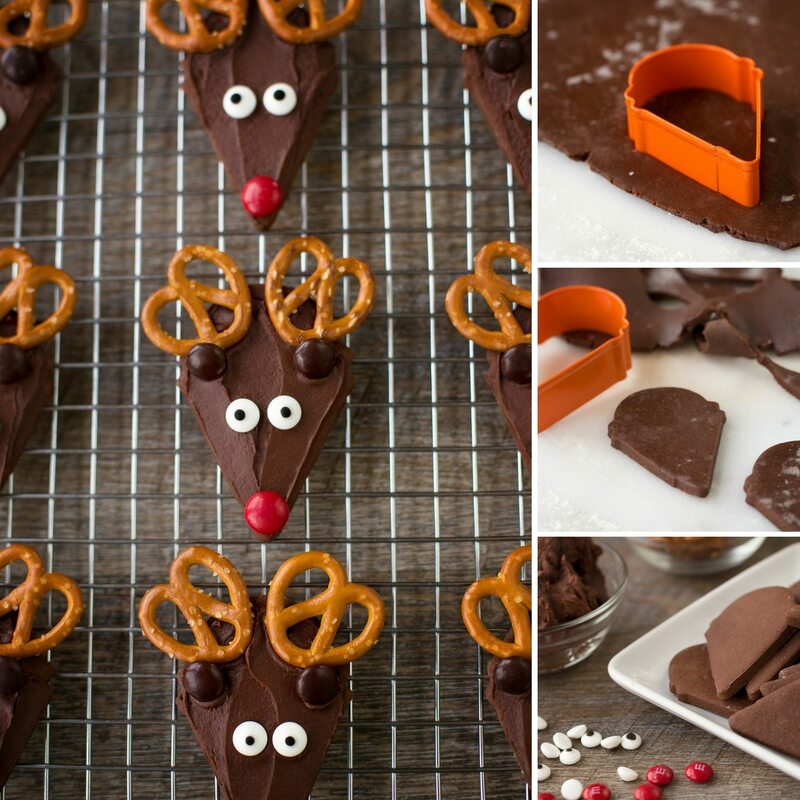 Chocolate Reindeer Cookies with pretzel antlers are the perfect festive treat for Christmas. Guaranteed to please kids of all ages, this fun recipe is an easy and whimsical cookie to make for holiday parties, cookie exchanges, or relaxing afternoons at home! A word of warning: this recipe is not for chocolate-haters. 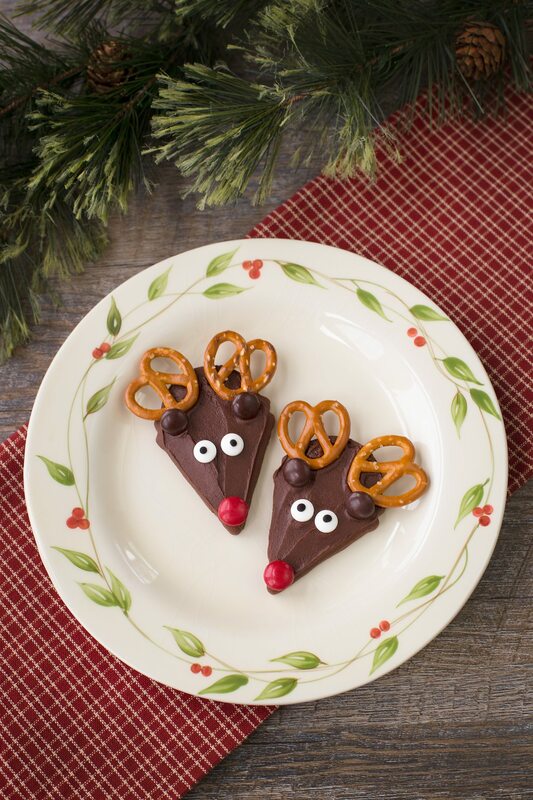 These adorable reindeer cookies boast rich chocolate flavor paired with the perfect hint of sea salt. Crisp pretzel antlers, candy eyes, and colorful M&Ms ears and noses delight kids and grownups alike. To achieve the perfect reindeer shape, use an ice cream cone shaped cookie cutter! Because this recipe does not contain baking soda or baking powder, these cookies cut and bake cleanly without spreading or rising. 1. After gathering the ingredients, beat the sugar and butter together until the mixture is light and fluffy. Stir in the egg and vanilla extract, then sift the cocoa, confectioner’s sugar, and salt over the butter mixture. Mix well. 2. Form the dough into a disc, wrap it in plastic wrap, then chill the disc in the refrigerator for several hours. 3. Roll out the dough on a lightly floured surface. Use an ice cream cone cookie cutter to cut out the cookies. 4. 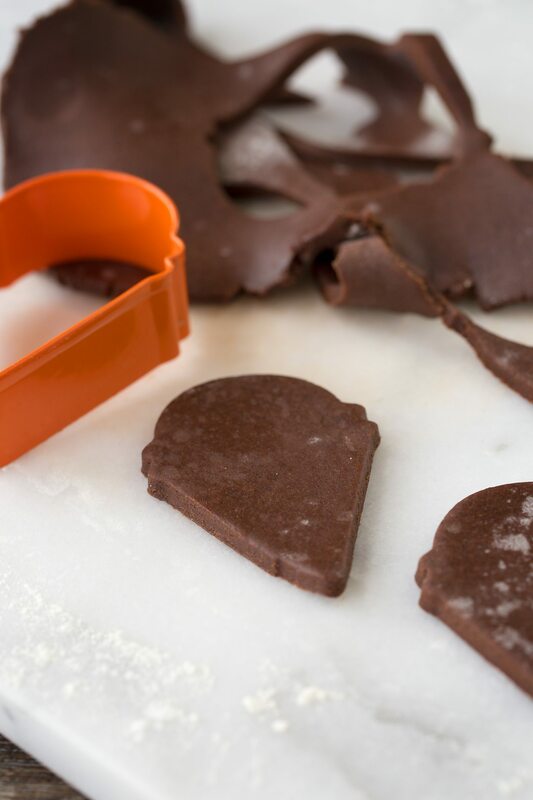 Place the cutouts on a parchment-lined cookie sheet. Bake the cookies for 7–8 minutes at 325°. Cool completely before decorating. 5. To simplify life, I used store bought chocolate frosting, but of course, you could use your favorite chocolate buttercream. I did remove the frosting from the container to add a pinch of sea salt, as salt simply balances the rich flavor of chocolate so well. 6. 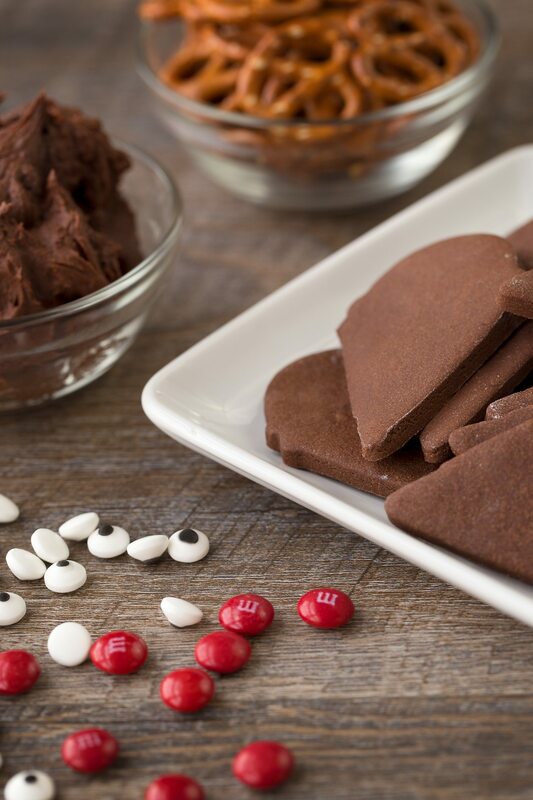 Invite kids to spread the frosting onto the cookies. 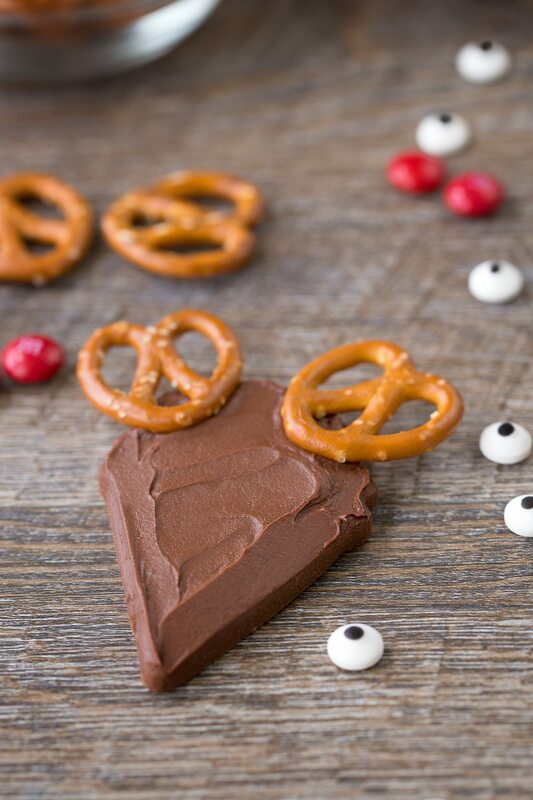 Place 2 pretzels at the top of the cookie for antlers, then apply the eyes, nose, and 2 brown M&M ears. With a tall glass of milk, of course! After gathering the ingredients, beat the sugar and butter together until the mixture is light and fluffy. Stir in the egg and vanilla extract, then sift the cocoa, confectioner's sugar, and salt over the butter mixture. Mix well. Form the dough into a disc, wrap it in plastic wrap, then chill the disc in the refrigerator for several hours. Roll out the dough on a lightly floured surface. Use an ice cream cone shaped cookie cutter to cut out the cookies. 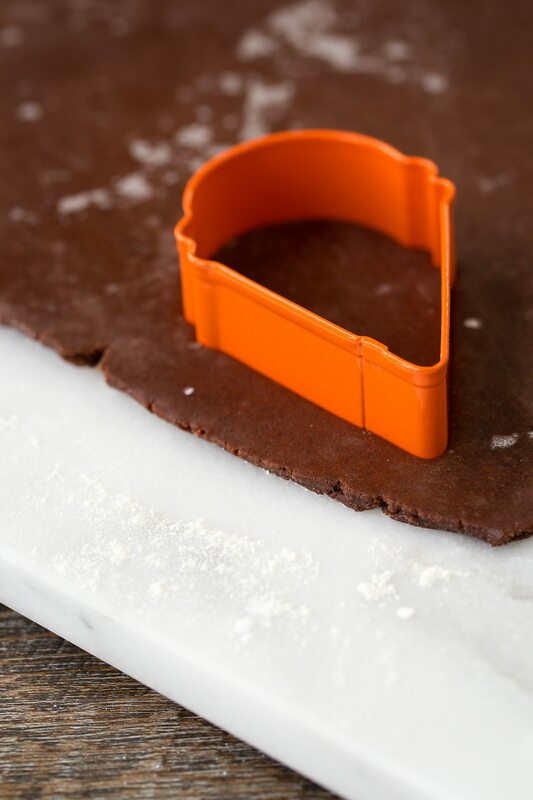 Place the cutouts on a parchment-lined cookie sheet. Bake the cookies for 7–8 minutes at 325°. Cool completely before decorating. Frost the cookies with store-bought chocolate frosting. If desired, add a pinch of sea salt to the frosting before decorating the cookies. Invite kids to spread the frosting onto the cookies. 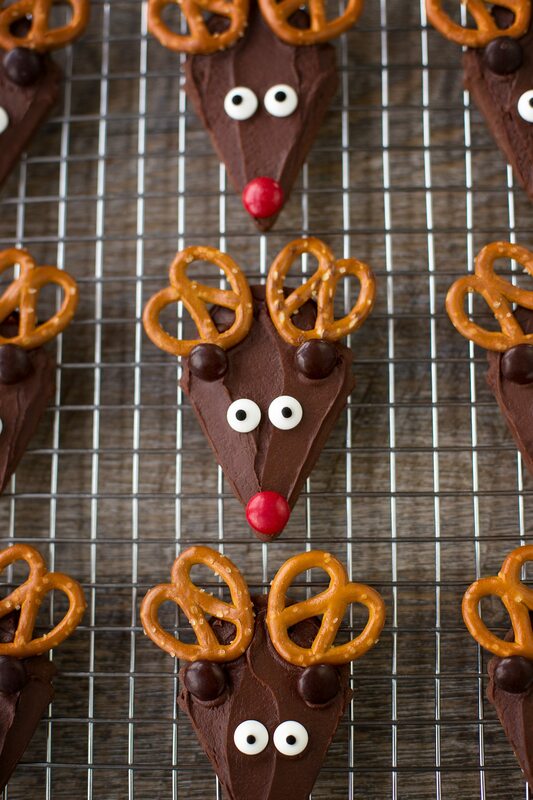 Place 2 pretzels at the top of the cookie for antlers, then apply the eyes, nose, and 2 brown M&M ears.